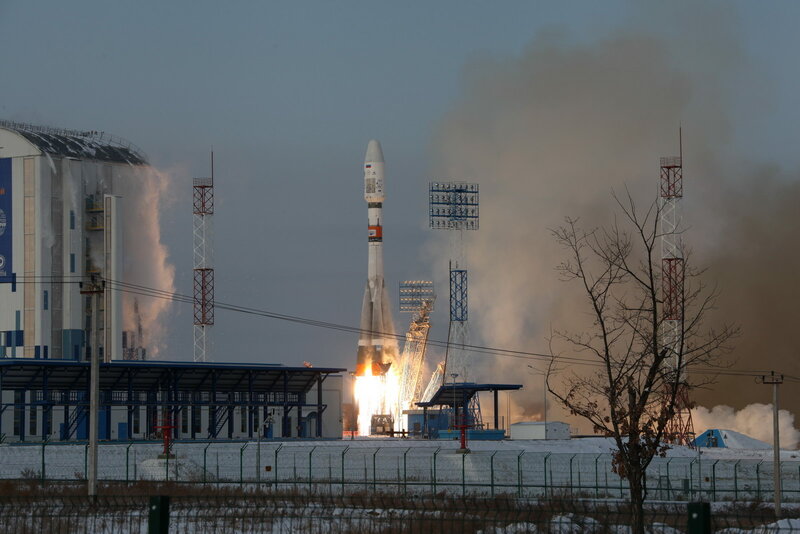 A new Russian weather observatory and the first prototype for Telesat’s planned network of 100-plus broadband communications satellites in low Earth orbit were among 19 spacecraft lost after a Fregat rocket stage ran into trouble soon after liftoff aboard a Soyuz booster Tuesday. The Fregat rocket pack was supposed to place the 19 satellites into four different orbits Tuesday in a four-hour flight sequence following launch on a Soyuz rocket from the Vostochny Cosmodrome, a new spaceport in the Amur region of Russia’s Far East. Seven Fregat engine burns were planned, first to place the upper stage and its multi-satellite payload stack into a preliminary orbit, then to maneuver to different altitudes for separation of Russia’s Meteor M2-1 weather satellite and 18 co-passengers, and finally to de-orbit the rocket to fall back into Earth’s atmosphere. But Russian officials said they were unable to establish contact with the Meteor M2-1 satellite after it was supposed to separate from the Fregat upper stage. A statement issued by Roscosmos — the Russian space agency — said engineers were analyzing the situation. A report published by Russia’s Interfax news agency Tuesday quoted a Russian space industry source who attributed the apparent failure to human error. The source said a mistake uploaded to the Fregat’s flight computer caused the upper stage to be in the wrong orientation for the main engine’s first burn, which was scheduled to last 77 seconds to reach a temporary parking orbit a few hundred miles above Earth. Interfax reported the mistake could have led the Fregat upper stage and its payloads to re-enter the atmosphere and fall into the Atlantic Ocean. The Russian space agency has not confirmed the account presented by Interfax, but officials have not reported any contact with the Fregat upper stage or its satellite passengers since the initial Roscosmos statement suggesting something went wrong with the launch. The mission began at 0541:46 GMT (12:41:46 a.m. EST) Tuesday with liftoff aboard a Soyuz-2.1b rocket from Vostochny, a launch complex near Russia’s border with China. The on-time launch marked the second rocket flight from the space base, following a successful Soyuz mission in April 2016. Live video from the launch base showed the Soyuz rocket rapidly climbing into a clear sky over the snow-covered spaceport. Telemetry from the booster indicated its four strap-on boosters, core stage and third stage all performed normally, according to a press release issued by TsSKB Progress, the Samara, Russia-based builder of the venerable Soyuz rocket. The 6,062-pound (2,750-kilogram) Meteor M2-1 weather observatory presumed lost carried four meteorological instruments: two multi-channel scanners and cameras to obtain infrared and visible images of clouds and ice cover, a microwave radiometer to measure temperature and humidity in the atmosphere, and an infrared spectrometer to monitor the ozone layer. 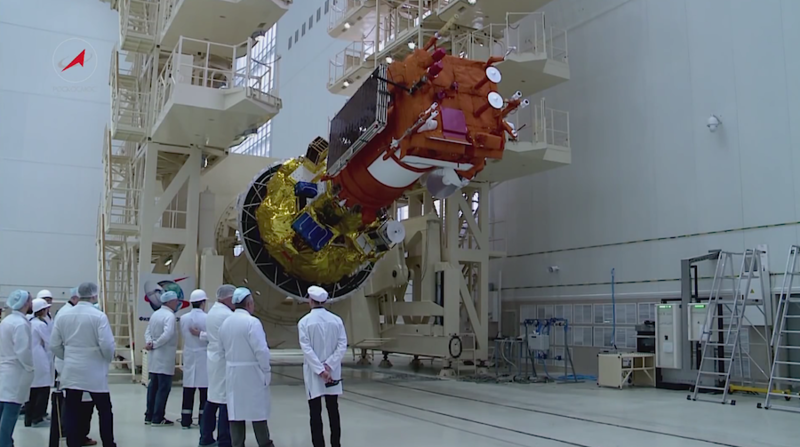 The Russian weather satellite also hosted a search-and-rescue radio transponder and a payload to relay data from remote weather stations and offshore buoys to Russian forecasters. Meteor M2-1 was the first Russian weather satellite equipped to receive emergency distress beacons through the international Cospas-Sarsat network. Built by VNIIEM, a Moscow-based aerospace contractor, the Meteor M2-1 spacecraft was the third in a series of upgraded Meteor M weather satellites. Two Meteor M satellites launched in 2009 and 2014 are still functioning, according to VNIIEM. The Meteor M2-1 satellite was designed to provide data inputs to help Russian meteorologists craft medium-range forecasts from a polar orbit 513 miles (826 kilometers) above Earth. 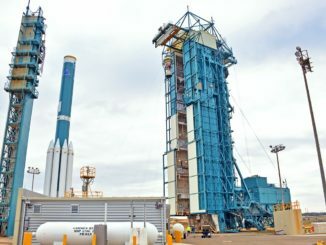 The Meteor M2-2 weather satellite is scheduled for launch in 2018, and two more Meteor spacecraft are under construction for launches in 2020 and 2021, VNIIEM said in a statement. The upcoming launches could help soften the blow of Meteor M2-1’s loss for Russian forecasters. Interfax reported the Meteor M2-1 weather satellite was insured for 2.5 billion rubles, or about $43 million. An experimental communications craft for Telesat was also on Tuesday’s mission. Telesat operates a fleet of geostationary broadcast satellites more than 22,000 miles (nearly 36,000 kilometers) over the equator, but the company plans to field a network of at least 117 lower-altitude satellites in the next few years, providing low-latency broadband links for airplanes, ships and customers in remote posts around the world. The Canadian company ordered two demonstrator satellites in April 2016 to help engineers wring out technical hurdles before the company builds out its Ka-band network. Telesat purchased the prototypes from different contractors to compare their performance. The LEO Vantage 2 spacecraft was expected to deploy from the Fregat upper stage into a 620-mile-high (1,000-kilometer) orbit. If the Interfax report is accurate, the Fregat failure is the third mishap of the upper stage caused by the vehicle’s on-board systems in 65 flights since 2000. A Fregat upper stage placed a Russian Meridian military communications satellite in a lower-than-planned orbit in May 2009, but the spacecraft was able to maneuver to the correct altitude using its own thrusters. 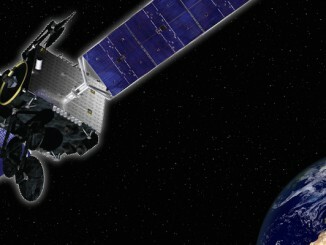 The cause of the incident was traced to an “erroneous input of data” that led the Fregat’s main engine to overuse propellant, resulting in a premature shutdown and release of the Meridian satellite into an off-target orbit, according to RussianSpaceWeb.com, a respected website chronicling the Russian space program. Another Fregat rocket tug placed two European Galileo navigation satellites in the wrong orbit after a liftoff aboard a Soyuz rocket from French Guiana in August 2014. Investigators discovered that hydrazine fuel lines leading to Fregat’s orientation control thrusters were routed too close to super-cold helium pressurant lines, causing the hydrazine to freeze and rendering the stage unable to point in the right direction for a critical orbit circularization burn. The Galileo satellites recovered from the failure, reaching a usable but sub-optimal orbit to provide navigation services for Europe’s independent global positioning network. Russia’s Phobos-Grunt Mars mission was stranded in Earth orbit in November 2011 when a variant of the Fregat upper stage was unable to send it on a departure burn toward the red planet, but that failure was blamed on an unexpected computer reboot on the spacecraft itself, not a problem with the Fregat’s systems. The Fregat upper stages are manufactured by NPO Lavochkin and are designed to fire multiple times to place payloads into high-altitude orbits or deploy satellites at different altitudes. Fregat space tugs are often used on Russian military satellite launches, and on commercial Soyuz flights from French Guiana managed by Arianespace, but are not part of Russia’s human spaceflight program. Other satellites aboard Tuesday’s mission included 10 Lemur-2 CubeSats for Spire Global’s fleet of commercial weather monitoring and ship tracking satellites. San Francisco-based Spire collects atmospheric data and monitors maritime movements with a constellation of several dozen CubeSats. Two commercial Landmapper-BC CubeSats manufactured and owned by Astro Digital, formerly Aquila Space, were also on Tuesday’s Soyuz flight. They were the third and fourth Landmapper-BC satellites to launch, following two craft that flew on a successful Soyuz mission in July, and failed shortly after reaching space. Astro Digital’s Landmapper-BC satellites are about the size of a shoebox and weigh around 22 pounds (10 kilograms), packing color and infrared cameras for wide-area imaging. The Silicon Valley-based company aims to field a commercial Earth-imaging fleet, initially with 10 CubeSat-class satellites, although the firm’s plans have hit a roadblock with the loss of its first four spacecraft. Two European CubeSats were also to be deployed Tuesday. The SEAM mission, led by Sweden’s KTH Royal Institute of Technology, was to conduct measurements of magnetic and electric fields in the ionosphere, a layer in Earth’s upper atmosphere where auroras are generated. The SEAM spacecraft was also a pathfinder for the design of future small-scale European science missions. Billed as the first German commercial CubeSat, the D-Star One spacecraft had four communications modules on-board, two of which were to be used by the amateur radio community. Developed by German Orbital Systems in Berlin in cooperation with the Czech company iSky Technology, officials hope to build follow-on satellites to construct a low Earth orbit communications network. The Baumanets 2 microsatellite built by students at Bauman Moscow State Technical University was also mounted to the Fregat upper stage. The 190-pound (86-kilogram) spacecraft’s mission was primarily educational, but the satellite also carried an optical camera and a communications experiment. The Norwegian Space Center’s AISSat 3 satellite was set to kick off a three-year mission to monitor ships and determine their position, speed and direction. 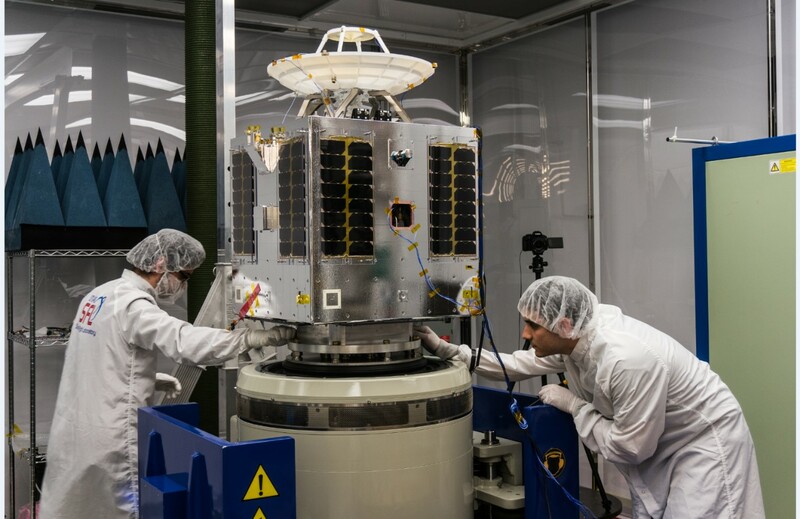 The 14-pound (6.5-kilogram) spacecraft, built in Canada by the University of Toronto Institute for Aerospace Studies Space Flight Laboratory, was the latest in a series of Norwegian maritime tracking satellites. 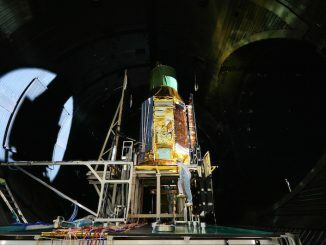 Manufactured and owned by the Japanese company Astroscale, the suitcase-sized IDEA OSG 1 satellite launched Tuesday was covered with sensors to register impacts with tiny pieces of space junk smaller than a millimeter in diameter. The space debris detectors, developed by the Japan Aerospace Exploration Agency, were to help tell scientists and engineers about the amount of space junk in low Earth orbit, focusing on satellite and rocket fragments too small to be tracked by ground-based radars. The IDEA OSG 1 spacecraft’s planned two-year mission was sponsored by OSG Corp., a Japanese tool maker, and was the first of several satellites planned by Astroscale. A follow-on mission conceived in partnership with Britain’s Surrey Satellite Technology Ltd. could launch in 2019 to demonstrate a relatively low-cost method of removing small pieces of space debris from orbit. The Russian launch broker Glavkosmos booked launch services for the satellites from international customers on Tuesday’s flight. The impact of Tuesday’s failure on future launches relying on Fregat upper stages was not immediately clear. Another Soyuz rocket and Fregat stage are undergoing launch preparations at Vostochny for a Dec. 22 liftoff with the Russian government’s Kanopus-V 3 and 4 Earth observation satellites, and a Zenit rocket is scheduled for launch with a Fregat upper stage in late December to place an Angolan communications spacecraft in orbit.